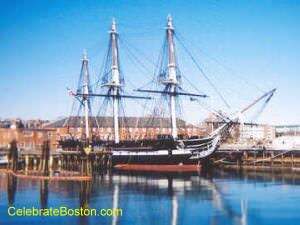 The USS Constitution was built in 1797 and is the oldest ship in the United States Navy. The ship was built in Boston's North End, and many of its spikes and fittings were made by Paul Revere's foundry. The ship was one of the first six frigates purchased by the United States Navy. In the War of 1812, a famous sea battle occurred between USS Constitution and HMS Guerriere. During the battle, cannon balls seemed to bounce off the ship's thick oak side as if it were made of iron, which gave the ship its famous nickname Old Ironsides. Constitution also won a battle against HMS Java not long after the victory over Guerriere. Constitution never lost a battle, and retired from combat in 1815. Old Ironsides, a poem by Oliver Wendell Holmes, popularized the ship's nickname. The poem was very important in an early preservation effort, which helped save the ship from the scrap yard. USS Constitution was totally refurbished in 1996. Every 4th of July the ship is taken out to the harbor and turned around to ensure even weathering. Tours are operated on the half hour by friendly and courteous active U.S. Navy personnel. A brief self guided tour of the deck is also allowed. The museum, located near the ship, is operated by the National Park Service. The first floor contains exhibits and films about the history of Old Ironsides. The second floor has an office for model shipbuilders, and several child-friendly exhibits. A ship's dinner table, real hammocks, and some vintage navy uniforms are available for younger visitors.